Priyanka Chopra set Beverly Hills on fire yesterday, as she stepped out with her husband, Nick Jonas for a night out in Los Angeles, USA. Hand-in-hand with her hubby, Priyanka radiated tons of gorgeousness as she donned a halter neck longline dress by Elie Saab. PC's show stopper of an outfit is from Elie Saab's spring/summer 2019 collection. The design is an interesting mix of sheer, embroidered and sequenced panels, placed in a chevron pattern. Elie Saab is known for creating glamorous evening wear pieces and just like them all, the one that Priyanka donned was uber stunning. While the dress perfectly hugged Priyanka's curves, she chose to compliment her natural beauty with a flawless base and her lips dazzling with a dark brown lipstick. The actress, gave structure to her face with a centre parted straight hairstyle. The newly wed couple, Nick Jonas and Priyanka Chopra were looking absolutely handsome together as they stepped out to grace an evening gala in LA. 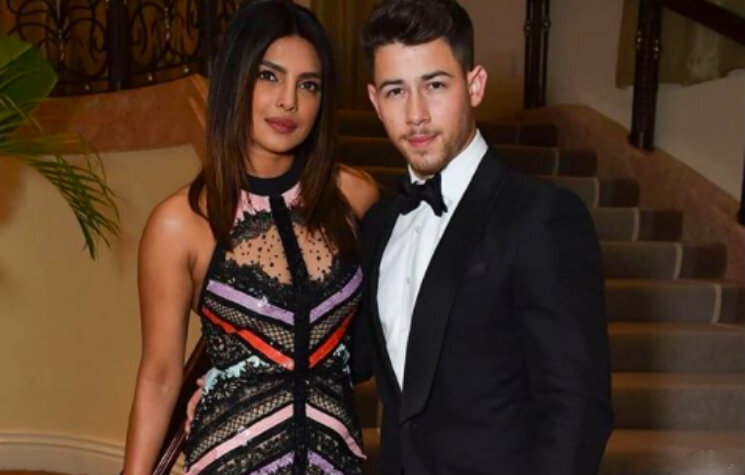 While Priyanka spelt elegance, Nick was dapper as always, this time in a black suit and bow-tie. Earlier last month, Priyanka appeared on Ellen DeGeneres show, first time after her three-day wedding extravaganza in Jodhpur Rajasthan. The duo enjoyed a two wedding ceremonies one a traditional Indian one and the other a western Christian.